Here is best "MIDDLESEX VS HAMPSHIRE " ,South Group,English T-20 Blast 2018, DREAM11 Predictions for the Fantasy user ,who venue are looking to make a strong team for maximum win. We are providing latest news, match update, information about the match .The team is picked by using various factors on the basis of performance, ground stats and latest form. "Both Middlesex and Hampshire have played five matches in this series so far,out of which only one has won.Both team sre significantly below the point table while Middlesex is at the last position in the table. 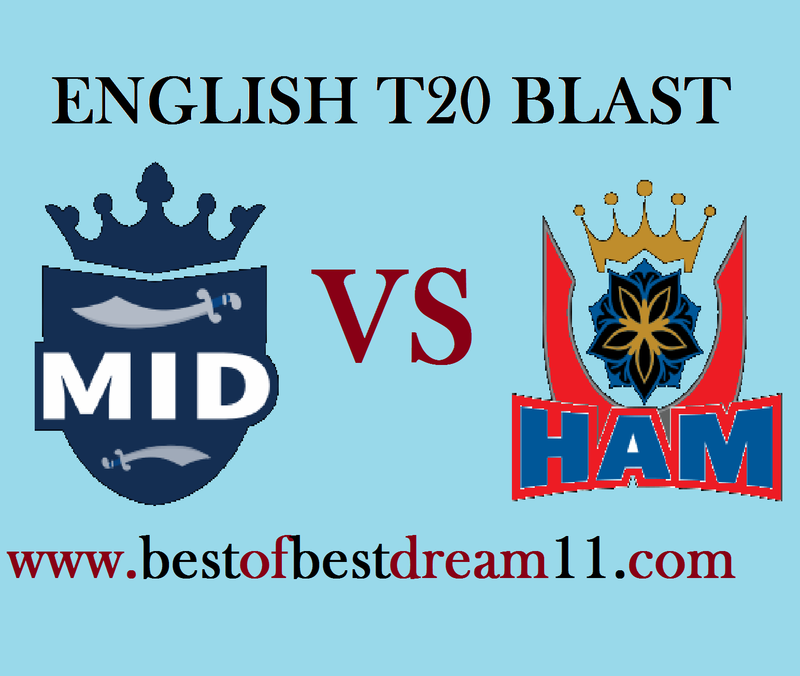 After losing four consecutive matches, Hampshire's team won the first win in the last match against Middlesex.In the previous match Hampshire scored 184 run while Middlesex team could have scored 163 runs only.Middlesex team will try to take over the defeat in the last match." Lords pitch is considered to be high scoring pitch but when the heat is high, pitch helps the slow bowler. 1- for Hampshire,In the last match, Colin Munro played a magnificent innings of 63 runs(40 balls) and took 2 wicket of MID team ,which earned him a reward of Man of the Match. 2-JM Vince(23run),RR Rossouw(32run) and LD Mcmanus(23) also played good inning in the last match. 3-in bowling,CP Wood,Mujeeb Ur Rahman and LA Dawson will be crucial bowler for their team. 4-For Middlesex, JK Fuller bowling great ,took 6 wickets in just 4 overs.Hampshire did not make huge score due to their excellent bowling. 5-MD Holden(36run),DJ Bravo(38run) and TG Helm(28run) played good inning in the last match.